Cheers to good health and eats in 2016! Peace of mind and bites of bliss at Native Foods. Friends and family like snowflakes are never the same. They cannot be replicated. However, Native Foods welcomes you as if you were family. District Manager, Paul Cichus says the restaurant chain attracts staffs that are conscientious about protecting animals and preserving health. The servers are naturally kind and considerate. And they serve oh-so-good for you scrumptious food! The Umami Burger with a distinctly Southwestern accent. 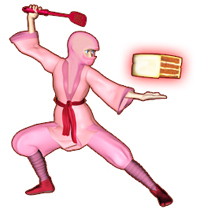 No matter your entrée, this Ninja Baker recommends that you leave room for dessert. no wonder the servers are so sweet! Locally grown berries kissed by brown sugar and oats. Wishing you heart-warming healthy meals with friends and family in 2016.